I’m going to take a deep breath and go off-topic again in this entry, with apologies to people who come here looking for chess coverage. As you know, I only write off-topic entries on rare occasions, such as the U.S. presidential election in 2008. This post is kind of a followup to that one. 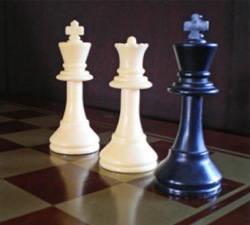 If you just want to read about chess, you should skip over the part between the asterisks and go to the chess discussion at the end of this post. Yesterday, the U.S. Congress had a momentary outbreak of sanity, as the House of Representatives passed a health care reform bill by a 219-212 margin. As anybody who follows U.S. politics probably knows, there has been a very heated debate on this issue over the last few months. Not a single Republican, either in the House or the Senate, has voted for the bill. Protests against it have been numerous and well covered by the media. Frankly, it’s baffling to me. First, so many parts of the bill just make good sense. And second, insurance is not something that you would expect anybody to get all riled up about. It’s all about numbers and risk and hedging. It’s the ultimate in wonkitude, an idea invented by mathematicians that makes ordinary people’s eyes glaze over. I say this affectionately, as a former mathematician myself. Instead they’re marching in the streets and chanting, “Health care no!” The Republican leaders in the House say that the Democrats are defying the will of the people. This, too, is strange to me. Memo to Republicans: You lost the last election. The people voted for the Democrats. And the Democrats said, loud and clear, that health care reform was on their agenda. It wasn’t just on Obama’s platform. It was on Hillary Clinton’s platform, and Jonathan Edwards’ platform, and Bill Richardson’s platform. It was abundantly clear that the Democrats were going to try to reform the health insurance system. That is what they said they were going to do, and that is what the American people elected them to do. They aren’t defying the will of the people, they are doing the will of the people. At least, it was the will of the people in 2008. And that’s the catch: America has an amazing case of amnesia. The Republicans may in fact be correct that the will of the people is different in 2010, and a lot of Democrats may in fact be voted out of office this fall. It’s very ironic. Usually politicians don’t do what they promise, and we keep re-electing them. This time they did what they promised, and there is a good chance we will boot them out of office for it. If so, yesterday’s vote will certainly be seen as a turning point. But I think that it may actually have been a turning point in a different way. It was the first time in Barack Obama’s presidency that he grew a spine. He drew a line in the sand, and he said, “We’re going to get this done.” Presidents have the ability to do that. George Bush, whether you liked him or hated him, figured it out. The result was that he sent us into a war in Iraq. Now that Obama has also figured out what a president can do, perhaps he will start delivering on some of the other changes he promised in 2008. The next three years may look very different from the first year of Obama’s presidency. And now, back to chess. Actually, I have a real dearth of chess news to report. It’s not that I haven’t been busy. Last week I spent quite a bit of time doing some work for a new chess enterprise that Andres Hortillosa is starting. However, I don’t think that it’s my place to provide any more details at this time about Andy’s project, or what I was doing. He should be the one to announce it, and I’m sure he will soon enough. Aside from that, I spent some time preparing my next ChessLecture, which I will record today. It will be episode 22 of my series, “Learn From Your Fellow Amateurs,” and it was quite interesting to me because I was forced to delve into an opening variation that I really knew nothing about: the 5. Bd2 line of the Winawer French. (That is, 1. e4 e6 2. d4 d5 3. Nc3 Bb4 4. e5 c5 5. Bd2.) The interesting thing about it is that one of the other ChessLecturers, Eugene Perelshteyn, co-wrote a book called Chess Openings for White, Explained, in which he advocated this line. A former ChessLecturer, John Watson, posted a scathing review online in which one of his main criticisms was the over-optimistic (for White) treatment of this variation. Yay for Health Care Now, AND a new chess video on the French!! I just returned to France, but happened to be in the U.S. on the day the health care reform bill passed and was surprised to see that no hospitals collapsed nor did I notice any doctors leaping from roof tops. I guess that fellow I saw in Los Angeles wearing a three piece suit with wingtip shoes carrying a sign telling everyone that the passing of this bill meant the end of the world was coming missed the call on this. Oh well. I found only tranquility amongst giant redwoods, sunny skies, and fresh air. There’s a place for chess. Looked for you in Santa Cruz, but no luck. Continuing to enjoy your blog.